Model 54A - Ludlum Measurements Inc. 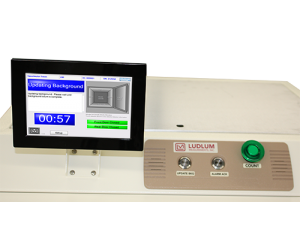 Automated, routine contamination frisker type instruments like Ludlum's Small Article Monitor are part of a well-proven methodology for ensuring that items leaving controlled areas are clean. 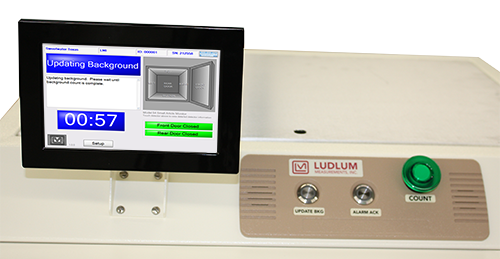 Ludlum's new Model 54A is a smaller version of the Model 54 and incorporates identical field-proven algorithms and features. The 45.3 L (1.6 cubic foot) volume of the Model 54A offers greater convenience for monitoring smaller articles. 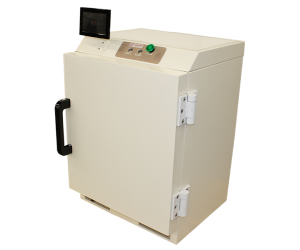 Central to the design is the detector chamber, which is configured to deliver an optimized detection volume for articles that fit within the chamber. Thick 5 cm (2 in.) 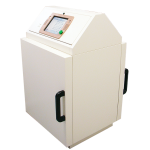 plastic scintillator detectors are specially designed and arranged to optimize the sensitivity throughout the chamber. A stainless steel liner protects the detectors while facilitating decontamination. 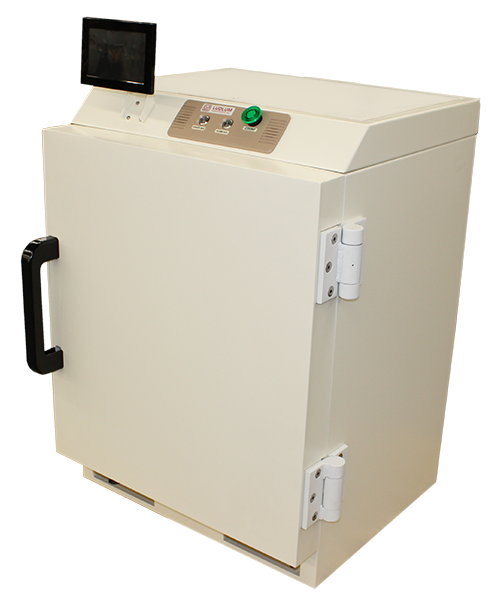 The chamber can be configured with either four or six detectors, and either 2.5 or 5.1 cm (1 or 2 in.) of lead. The lead is shipped separately and easily loaded on site. The Model 54A is equipped with a single door, which can be mounted with either a left- or right-hand swing. Hardened steel hinges, securely bolted to the instrument frame, employ ball-bearings to make operating the doors as easy as possible. Very powerful, non-jamming, electromagnet-activated door locks are employed to keep the door locked until the count is completed or until an alarm is cleared, depending upon the set-up. Operational status and instrument condition is clearly presented to the operator via a 17.8 cm (7 in.) LCD touch screen. The software displays are designed to be very intuitive and are accompanied by a large-size push-button to activate sample counting. There are also two smaller push-buttons for updating the background or acknowledging any alarms. The main counting screen is locked with password-controlled access via the touch screen. From the main screen, the user can perform either routine check functions at one level or access all parameters at a second level. The electronics support the latest Ludlum detector boards, which are connected to a PC-based fan-less embedded computer running on Embedded Windows™ XP platform. 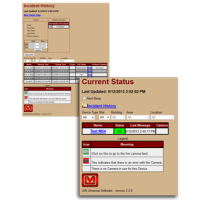 The system also provides an ethernet port that enables connection to the site LAN for collecting all count and alarm data as well as monitoring all activities remotely from one or more locations. When taken in total, the Ludlum Model 54A Small Article Monitor delivers state-of-the-art technology in a robust design with enhanced performance, user-friendliness, and connectivity at the lowest cost on the market. User Pushbutton Controls Start/Stop Count, Background Update, Alarm Acknowledgement. All other control functions are available via the LCD touch screen. Password protection employed.